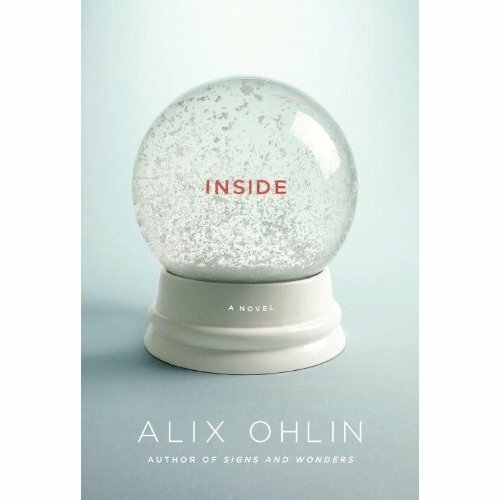 I was lucky enough to get advanced copies of Canadian author Alix Ohlin’s upcoming novel, Inside, and collection of short stories,Signs and Wonders. I hadn’t heard of her before stumbling across her work in the House of Anansi spring catalog one day at work. (We’re featuring the novel in the upcoming issue of our mag.) After learning more about Inside and its vividly human characters and interwoven narratives that go from Montreal to NYC, the Arctic, Africa and LA, I knew this was exactly the type of book I’d love to sink my bespectacled teeth into. One that explores the complicated relationships that can arise when we let people into our lives, what motivates us to help others, and how we’re often so terrible at helping ourselves. I read Inside on our honeymoon and occasionally had the feeling that Grace, a Montreal therapist, her unhinged boyfriend, Tug, her angsty teenage patient, Annie, and her ex-husband, Mitch, were sunning themselves in loungers next to me on the beach. That’s how real these characters felt; that’s how far Ohlin pulls you into their inner lives. When we got home from Mexico, I couldn’t wait to tear into Signs and Wonders. The first story in the book blew me away (I read it twice in one sitting) not because of what happens in it, per se, but because of how Ohlin unrolls the events. Throughout the stories, she relays life’s tragic, sometimes bizarre, events without being overly-dramatic or try-hard, but with a gentle, intoxicating matter-of-factness. I’m at an impasse, though. After devouring 15 of the collection’s 16 stories, the last one has remained unread – the top corner of the first page folded over, marking my place – for the past week or so. I’m dying to read it, but I’m not sure I can go back to a life without an Ohlin paperback in my purse. She’s written two other books (phew! ), The Missing Person and Babylon and Other Stories, so I think I should go ahead and enjoy that last story, savoring it until the very last word, knowing there’s more Ohlin goodness to be enjoyed. This entry was posted in Reading and tagged alix ohlin, alix ohlin inside, alix ohlin signs and wonders, alix ohlin the missing person, author, book, books, bookshelf, canadian author, celebrities, entertainment, inside, literature, love, paperback, reading, signs and wonders, spring catalog, the missing person, travel, vacation, write, writer, writing by lovewritenow. Bookmark the permalink. Such a bittersweet feeling, isn’t it? That sense of loving a collection so much that you don’t want to read on and, yet, can’t stop it either. I’ve only read her novel, and only since the Giller longlisting, but I’m keen to explore the rest now as well.